About By Faith Design Co.
GDPR seems to be all we’re hearing about at the moment. But what does it all mean? I’ve had a lot of clients come to me concerned about how it’s going to impact their websites and what they need to do to become GDPR compliant. At this point you’re probably thinking ‘GDPR compliant? What? ?’ 😕Sounds technical, and boring and a bit scary right? But fear not. In this post you’ll learn what the GDPR is, how it impacts you and I’ll also give you 5 actionable steps you can take right now to help make your website compliant with these new regulations. A quick disclaimer: You can probably tell by my use of emoji’s that I am not a lawyer by any means. You should not take the information contained in this article as official legal advice. Please consult a specialist GDPR compliance lawyer before making any decisions about your website’s compliance to GDPR. GDPR stands for the General Data Protection Regulation. It’s a policy created by the EU to protect personal data such as names, contact details and interests provided by individuals to third-parties. The goal is to ensure website owners and organisations big and small take measures to ensure the data provided to them is kept secure and is never used for a purpose other than that which the individual has consented it to be. The focus is primarily on protecting the personal data of individuals based in the European Union however these regulations will no doubt have a positive impact on protecting the data of people worldwide. Which website owners need to comply with the GDPR? It’s a common misconception that only EU-based organisations or organisations who promote their products and services to EU customers need to be GDPR compliant. However, all website owners, not just businesses but even personal bloggers and non-profits, who allow their website to be viewed by EU residents are expected to comply with the GDPR. So essentially, unless you have intentionally allowed your website to be inaccessible from countries within the European Union you are expected to comply. Many business owners I know outside the EU have been a little stroppy about these new regulations being imposed on businesses like ours literally on the other side of the world. Yes, I’ll concede, initially I was kinda annoyed too. However, after looking into the intent behind the GDPR I’m now wholeheartedly onboard. If the GDPR can help make the Internet a safer place, reduce spam, identity theft and unauthorised use of our personal data then I’m all for it. Why it’s important your website is GDPR compliant? Well first of all there are some hefty fines if you fail to comply. But on top of that I feel it’s important to be GDPR compliant so as we all take responsibility and participate in making the Internet a safer place. How to make your website GDPR compliant? If you’re collecting your website visitors email addresses and storing them in a database you should have double opt-in enabled. This will ensure you have the consent of all your subscribers. Double opt-in is when a subscriber is sent an email and asked to confirm their email address and subscription to your list, generally by clicking a button or link within that email. If this doesn’t happen already, you can enable double opt-in by logging into your email marketing account (i.e. MailChimp, ConvertKit, etc. ), finding the option and turning it on. Refer to your provider for specific instructions. You may also need to ensure double opt-in is enabled on the form plugin you use to collect the email address on your website, such as Bloom or Gravity Forms. Some people, in my opinion, have gone a little overboard by adding checkboxes to their forms to gain official consent. This is what I’m talking about… not the best for user experience don’t you think? The Facebook Pixel records usage data of Facebook users and reports back to Facebook helping to build the user’s behaviour profile. Although, you don’t have direct access to this data, if you have Facebook Pixel installed on your website it’s still advisable you provide users with the ability to opt-out of tracking. The good news is there’s a super simple solution called Facebook Pixel Opt Out plugin. Simply add this plugin to your website and configure the settings and you’re good to go. According to GDPR, an IP address is considered personal data. Therefore, anything that records an IP address needs to comply. A common thing on most websites that records IP addresses is Google Analytics. Install and configure Google Analytics Dashboard for WP plugin. Once installed, go to Google Analytics in the sidebar of your WP Dashboard, then click Tracking Code > Advanced Settings > and set “anonymize IPs while tracking” to on. If you’re website doesn’t already comply with the EU’s Cookie Law then now is a good time to get on top of that as well. Both of these examples were created using the Divi Bars plugin by Divi Life. The plugin comes with these templates already set up so it’s even simpler to get them appearing on your website in no time. Too easy! Where to find help and more information about GDPR? 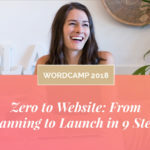 I really hope you’ve found this article helpful and have some clear steps you can take today to get your website up to speed. If you’d prefer to stick to what you love and leave this boring web stuff up to a pro, then get in touch with a web designer (like me!) and we’ll be happy to help out. Please note: I will only ever recommend a company’s product or service I have tried, tested and above all love. So needless to say I’m very picky about who I become an affiliate for. Some links on this website are ‘affiliate links’. This means if you click on some links and purchase something from that company, I may receive a small commission. Hola! I'm Emma. I’m a graphic designer turned web designer on a mission to teach others how to build beautiful & professional websites with WordPress. Through mentoring and my eCourse I teach other graphic designers and entrepreneurs how to build their own websites using my 9-step process. In my spare time I love writing about my freelance life, creating pretty things and hanging out with my fur-baby. Don’t be shy. Want to say hi and have a chat? Get in touch and let's start the convo about your exciting new project. Don’t be a stranger, send me an email via the Interwebs to have a yarn about your upcoming design or website project. So you've website stalked me and like what you see? Shucks! I'd love to hear more about your project and how I could help. Is your website misbehaving? I can provide comprehensive support to get you up and running in no time.